All member meetings are held at the BRASS POINTE RESTAURANT in Farmington Hills. The restaurant is located at 24234 Orchard Lake Rd., just north of 10 Mile Rd. There is easy access to I-696 about 1/2 mile further north. 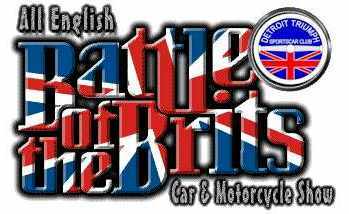 The 34th Annual Battle of the Brits was Sunday September 11th. Thanks to all that attended - hope you had fun. And thanks to all the volunteers for your hard work..
Bryan Weston sent in these pictures from this years Battle- Enjoy.. Here are a few pictures I took. If you like I can share yours as well reply to one of the manyt emails your recieve from me and I will create albums to share.. I mentoned at the last meeting a Web Site that lets you design a Dash Panel and have them make it. Here is my experiemce using it for my boat panel. First Battle Pictures - Only a few from my camera - feel free to send yours and I will add to the Album. Bob Renner has already sent me his picture of the show. Thanks Bob!!! Here they are enjoy. If you are not a member and own a Triumph or other LBC you owe it to yourself to join this club. It's the most active, fun and friendly club you'll find. Become a Member and join in on the Fun. See a recap of our Year End Party and a review in Pictures.